In early 2011, citizen uprisings in Syria began, calling for the Regime to fall. By the end of 2012, this had spiralled into a proxy world war, with all of the world’s superpowers fighting on the battle ground of Syria via varying proxy forces. It was in this environment, in the summer of 2012, that Kurds in the majority Kurdish city of Kobani on the Turkish border, announced their revolution. People took to the streets. The regime, already weakened and fighting heavily on other fronts, receded from the area. 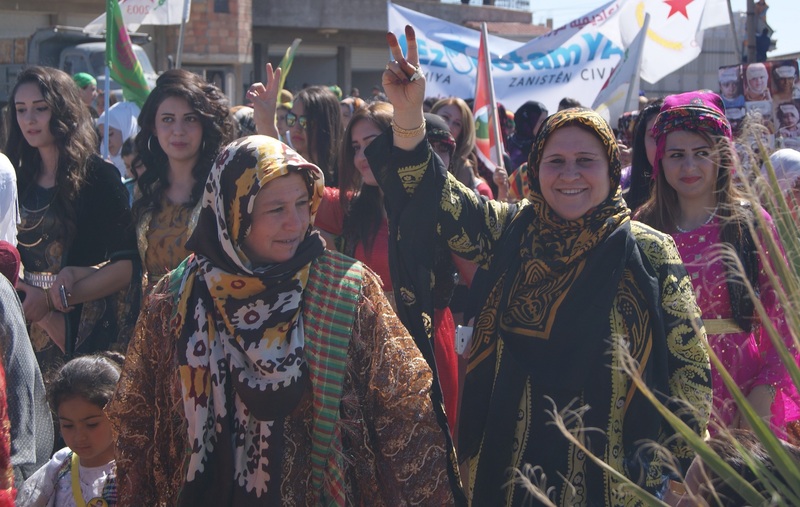 Now this Kurdish-led (but increasingly pluralist) social movement was able to begin putting into practice the model for a new paradigm that until now had been operating underground, in Syria as well as Turkey. This ideology and the principles that underpin it are based on the political thought of Abdullah Ocalan, in a model he has termed Democratic Confederalism. Rather than a nation state, this model is based on a matrix of autonomous, but accountable, neighbourhood assemblies (or ‘communes’), civil society organsiations, political parties, unions, co-operatives, etc. It seeks autonomy within currently existing borders, rather than an independent nation state. It works from the bottom up, via a system of rotating delegates, with quotas for men, women, and each of the different ethnic groups that make up the community. This paradigm is based on three pillars: direct democracy, women’s liberation, and ecology ─ and co-operation plays a crucial role. The ultimate aim is for co-operatives to make up 80% of the economy in Rojava.